Watch out Boston, New England, America. 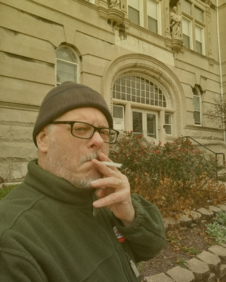 While we’ve been looking elsewhere, it appears more and more newspapers, magazines and journals are grappling with the debate over legalizing illicit drugs. Once the subject was considered so taboo that no mainstream publication would touch it. 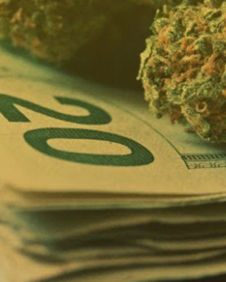 Now, stories on legalization are cropping up everywhere from The Boston Globe to Time magazine. The issue burst on the national scene last year in May when Time ran a cover story on drug legalization —“Thinking The Unthinkable”— and Newsweek published “Should Drugs Be legalized?” That same month saw Jet with a story on Baltimore Mayor Kurt Schmoke’s proposal for legalization. Since then, increased numbers of mainstream, mass circulation magazines and newspapers have talked to experts, commissioned polls and debated the merits of repealing laws prohibiting the use of illegal narcotics. Reasons for the recent turnaround in the press are arguable. However, the most visible side effect of the nation’s war on drugs—urban street violence and death involving the drug trade—appears to be the driving force behind the Fourth Estate’s growing attention span. “I think you could argue it has nothing to do with crime issues— ‘They are higher on the national agenda because of medical issues’—and make a case for that,” Randolph Ryan, eight-year veteran editorial writer for The Boston Globe, offered in a recent interview with Quimby. Far and away the city that has received the most recent attention on this aspect of the problem is Washington, D.C. Drug related violence there has accounted for 300 deaths, giving it the highest per capita murder rate in the nation, and almost 50,000 arrests in the last two and a half years. Those numbers are a big reason Ryan penned “Another Route On Drugs” in his paper’s April 17, 1989 edition. During a fifty-minute interview at The Globe’s main office, Ryan had this to say when I commented that the striking aspect of the piece was not its content but the fact that it appeared at all. “Well, I think there’s always (pause) a sense of care when you’re writing about an important public policy issue which is controversial and which the answers (pause) are not clear. What The Globe has done is join a rising chorus of publications that are taking the legalization debate very seriously. Since early last year the issue has been given space in Business Week, Maclean’s, The New Republic, Christianity Today, USA Today, and Glamour, to name a few. Of course, the angles to this story are varied. 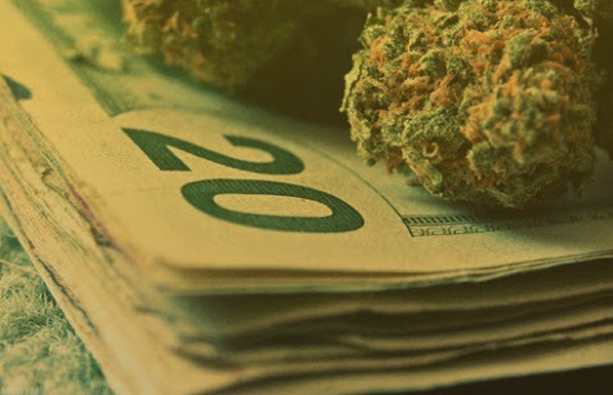 Just as many organs decry legalization as there are those that simply promote investigation. 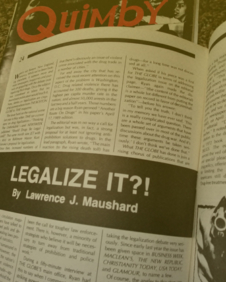 In The New Republic, M. Kondracke wrote “Don’t Legalize Drugs” (June 27, 1988), while T.C. 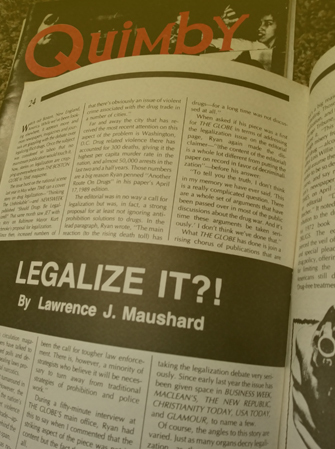 Muck wrote “Stoned Logic (Legalizing Drugs) in Christianity Today (Aug. 9, 1988). Other stories have appeared in a vein more or less represented by the likes of “Drug Wars: Legalization Gets A Hearing” in Science (Sept. 2, 1988) and “The Lesson of Prohibition” in USA Today (Dec. 1988). The Times piece in no way addressed the legalization issue. 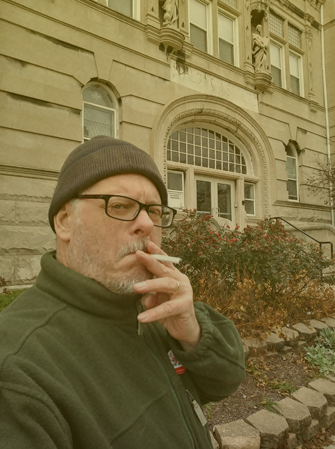 Yet it touched on some of the facts concerning “heroin, caffeine, nicotine, alcohol, barbiturates, amphetamines, tranquilizers, cocaine, LSD, and marijuana,” facts that lead to ever more intelligent public discussion of the whole panorama of drugs, legal and otherwise. Whatever the outcome of the debate, drug legalization is an issue sure to receive a growing hearing in the public domain. Ryan, for one, assured me he would continue to investigate legalization and write about it in the future. Appeared in Quimby Magazine 1989.